In the midst of growing national attention to mental health several organizations have started providing resources and programming specific to the target demographic most relevant to our work as UP faculty: college students. One particularly prominent organization in this realm is The Jed Foundation, started in 2000 by a philanthropist couple who lost their son (Jed) to suicide during his sophomore year of college. Some of us at UP have become familiar with The Jed Foundation in the last few years after the 2015-2016 President’s Panel on Mental Health recommended working with the Jed “Campus Program” which they describe as “A nationwide initiative designed to guide schools through a collaborative process of developing comprehensive systems, programs and policies with customized support to build upon existing student mental health, substance abuse and suicide prevention efforts.” This program involves a multi-year consultation towards improving mental health on college campuses, and UP has begun some of the initial steps in working with Jed on our campus. 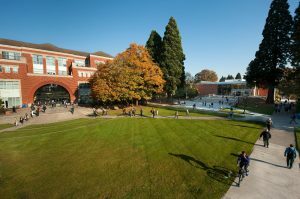 They estimate that over 150 colleges are participating in the program, including schools such as Notre Dame, the University of Washington, Princeton, and Georgetown, so we are in good company! The Jed Foundation has many other related informational resources, and links to other related resources such as relevant web-pages for the American Association of Suicidology and the National Suicide Prevention Lifeline. Though it is worth remembering that faculty and academic staff’s main job with students of concern is to get them connected to the professional resources they need, we can also keep ourselves informed. 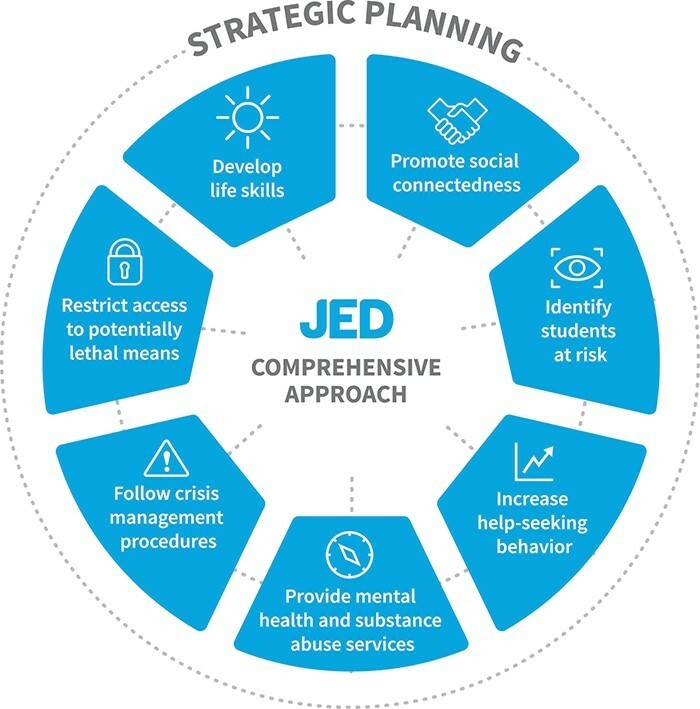 And it may also be helpful for faculty and academic staff to remember that promoting students well-being really does require what Jed calls a “comprehensive approach” (also see their strategic planning diagram below). Their model for colleges and universities includes components for helping students develop life skills; promoting social connectedness; identifying students at risk early; increasing help-seeking behavior; providing adequate mental health and substance abuse services; following appropriate crisis management procedures; and reducing access to potentially lethal means. Faculty and academic staff are only one small part of this larger whole – but for the sake of our students, and for our own sake when we confront challenges in the classroom, we can take advantage of our academic brains to learn about and understand what national organizations such as The Jed Foundation already know. As the term unfolds, many professors will be asking students to work productively in groups. While there’s lots of evidence to support collaborative learning, both in terms of knowledge gained and essential work skills honed, many professors are also faced with groups that don’t gel or fall under the dominion of one hyper-achiever, and the occasional student who is willing to ride on colleagues’ coattails. Then there’s the question of group versus individual accountability. 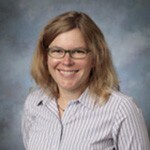 Nikki Schulz, engineering (pictured), and Ross Hanig, business, suggest checking out the teacher-designed web site CATME.org, which offers many suggestions for overcoming obstacles that can keep learning groups from functioning optimally. The site provides quick inventories that allow professors to form groups which are more likely to be productive, tips from the trenches for managing the noise and extra movement groups generate, keeping track of individual contributions, working through personality conflicts, and getting students to make equitable contributions to their final course projects. Like any tool, it can’t answer every possible problem, but it is field-tested and a good place to start if you find yourself up against the same issues and complaints regarding group work. And as with most TLC tips, pursuing CATME.org for the length of time it takes you to drink a cup of coffee at your desk may pay some excellent dividends. For more information contact Karen Eifler at eifler@up.edu.